I have discovered the power of glue this weekend past and also the power of the Christmas season to get me motivated to create create create. 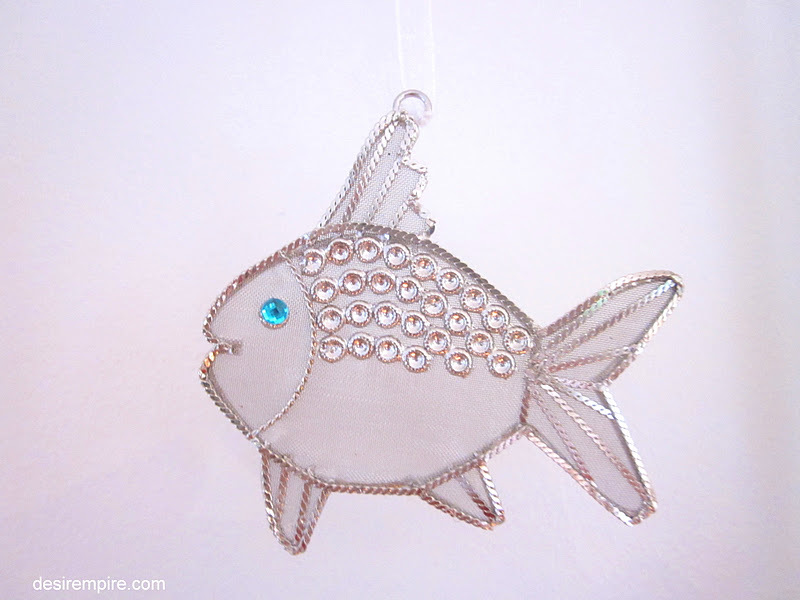 The craft is just flowing out of me this Christmas season and I must say it is making blogging very very enjoyable. Thanks for all the love on my Too Easy Christmas Series as well gals!!!!!! I'm so thankful for you all. The frame in this vignette started out like this and has been shunted around the Beach House since I picked it up for $2, at the Scouts' Spring Fair some months ago. I loved the embossed frame. It seems to have a pineapple motif carved into it, which appealed to me greatly. I was thinking about using it in some South Pacific styling extravaganza, but try as I might, I just couldn't get my head around all the brown. I can't understand why designers and stylists brought that colour back a few years ago. Being a child of the seventies, I have terrible memories of brown corduroy ankle freezers (thanks mum) and lots of brown stained trim around our blond brick house. 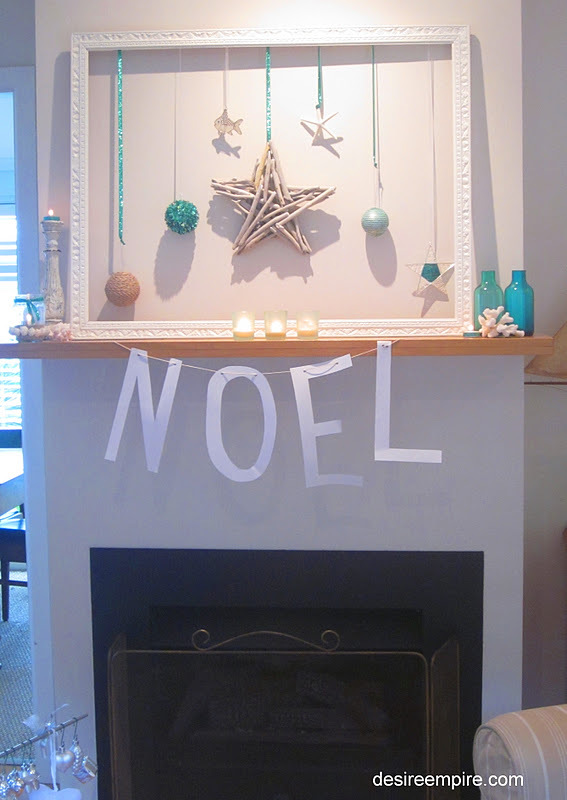 So the white paint came out this weekend to aide in the creation of a Coastal Christmas Mantel. Freedom are promoting a range of coastal Christmas decorations this season. I am such a sucker for aqua. I glued it around some tea lights to joosh them up. How cool are these beads? The beachy lantern I made from the jam jar last weekend, got a guernsey too. The letters I just drew up and cut out of standard white A4 paper that I hole punched and strung up on twine. Mr Beach House said 'Who's Noel and when's he coming over?' I don't think he's that hopeless, but he is pretty funny when he wants to be. Then in the middle if all this Mr Beach House was strongly encouraged to install the littlest Beach House Brat's new Hemnes bed. I mean she is 3 and a half and still in a cot. He started the process, then decided he was going sailing, so as I write the bed is still in pieces on the floor. Wish I could just walk out when I felt like it to do my own thing. The cot is dismantled and there's no way she's sleeping with me!!!!! Learned that lesson the hard way with the first one. So we shall see what happens at the beach House tonight.......a home in which you never know just quite where you will wake up! Have a great week girls. Glad I got the tops and bottoms of the PJs matching for these shots, as that doesn't happen very often around here. Gorgeous. Love it. Has all my favorite colors. 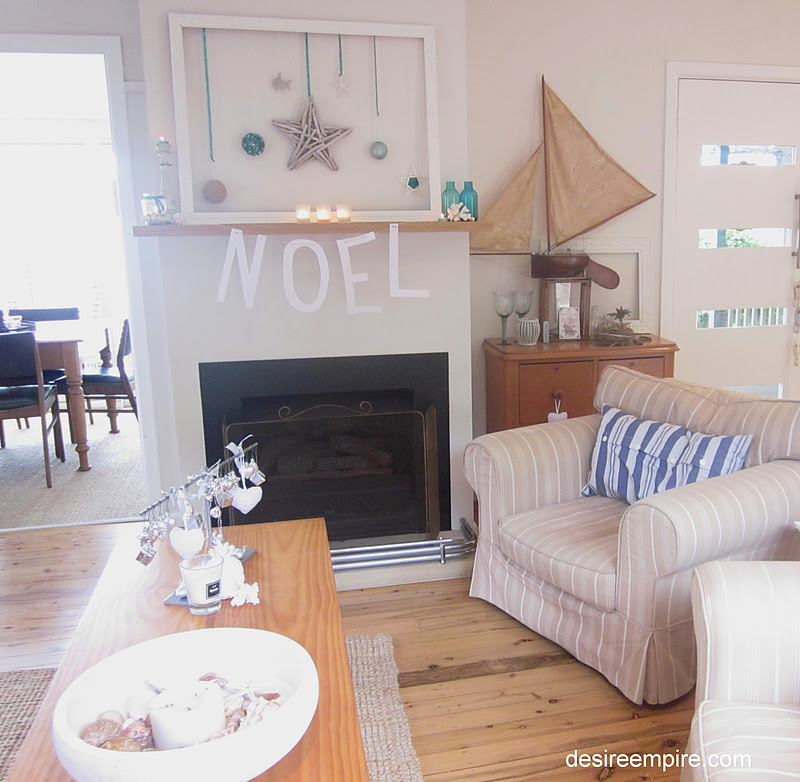 Perfect for a coastal christmas. 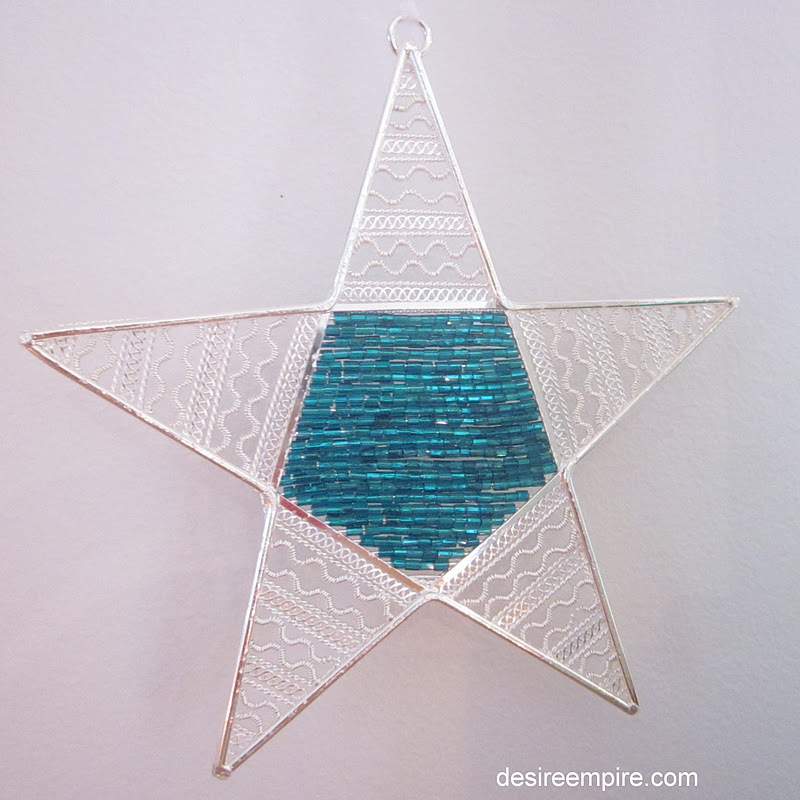 I am truly loving all these blue & soft greens everyone is using for Christmas decors. Just gorgeous. What adorably kid=lings. Everything is so pretty. I have beach envy and so jealous that you're enjoying summer instead of winter, although I can't quite fathom what Christmas would be like in the middle of the summer. 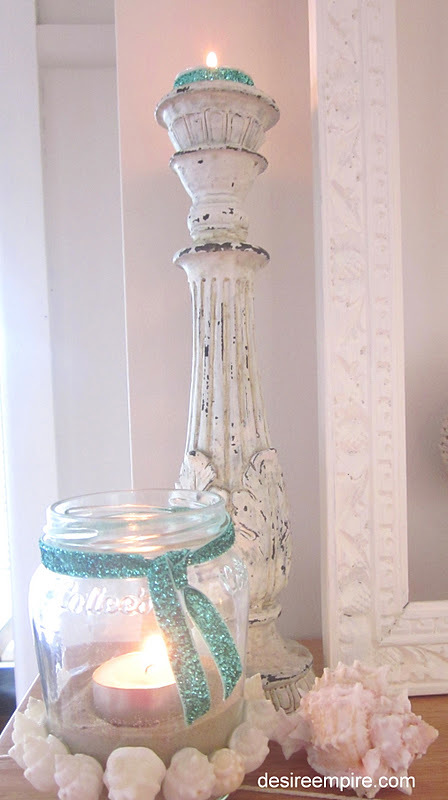 Love your mantel and your decorating. Carolyn I am a whiz at those to-be-assembled Ikea pieces as it seems I have done zillions of them for the guys here! If it wasn't such a long trek - involving ocean crossings - I'd be at your front with door drill in hand. (As I don't think I'd ask your son to give that one up!) Love the framed piece on your mantle and the shadows it casts too! 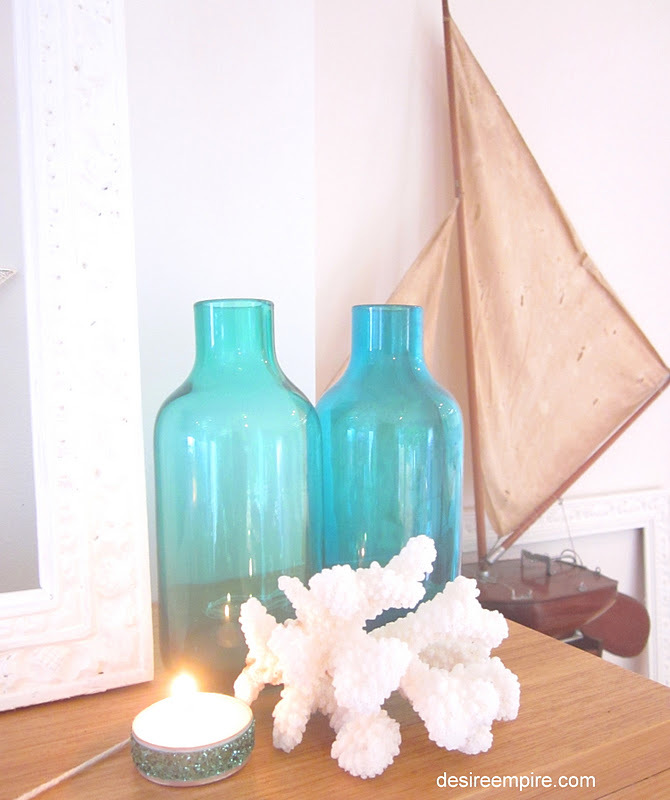 Coastal charm with all the gorgeous turquoise. Very creative and pretty mantel display! 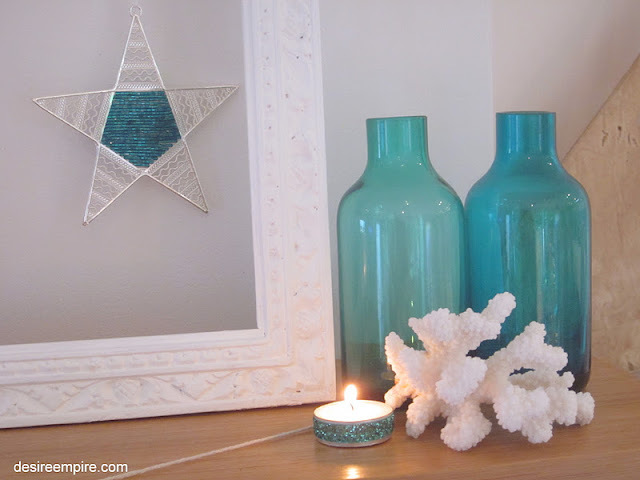 The beachy look with whites and aqua has really grown on me its so fresh looking!! Oh I love all your blues and white. It is so pretty and that frame is such a fabulous idea. Your decorations are just gorgeous! 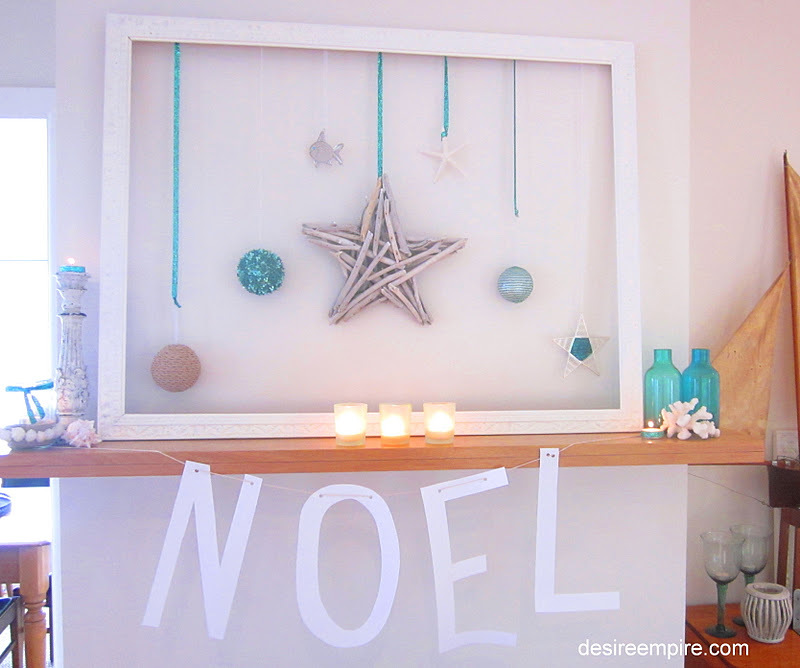 Your Christmas mantel is beautiful! I love all the turquoise. You are so talented love that frame, I have painted a few white myself but you have decorated this in style. Your noel is a great idea looks wonderful thanks for sharing my friend hope you have a lovely day. Your house is looking so Christmassy - I'm so jealous. You are just getting into the spirit in such a great way. Looks wonderful. I'm sure you'll get the bed up by the new year! Cute kids! 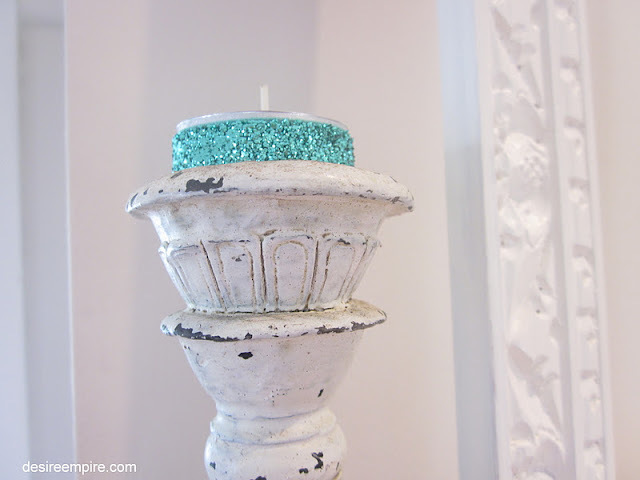 Your mantel is so pretty! I LOVE the turquoise! This is such a pretty mantel display. It certainly has coastal charm...nice job! You have done your mantle just right, a perfect fit for the room. Love the teal and white for the coastal look. Total perfection!!! I love it!! Merry Christmas! Beautiful! 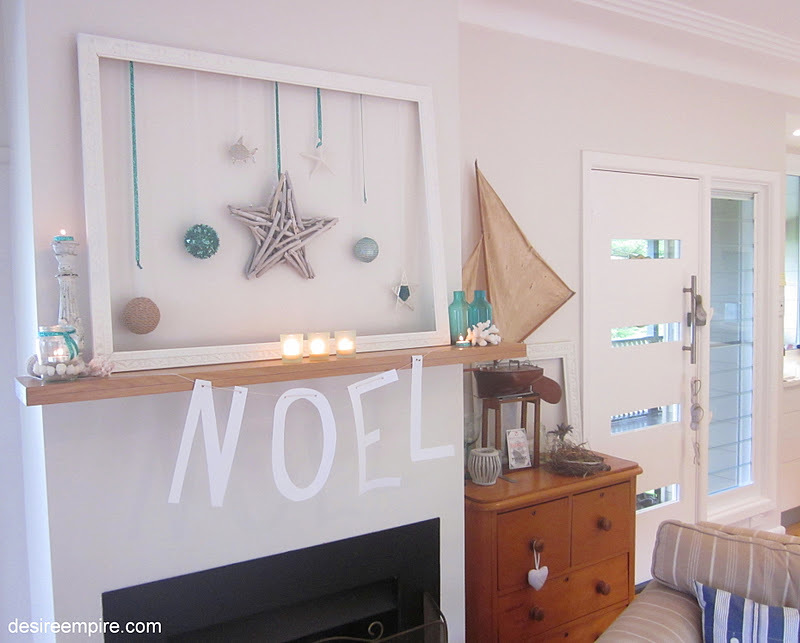 I've been looking for some beachy inspiration for Christmas, so I was happy to find this. Thanks for sharing! Your Christmas creations are wonderful! love the clean lines of that mantle, and great turquoise pops!